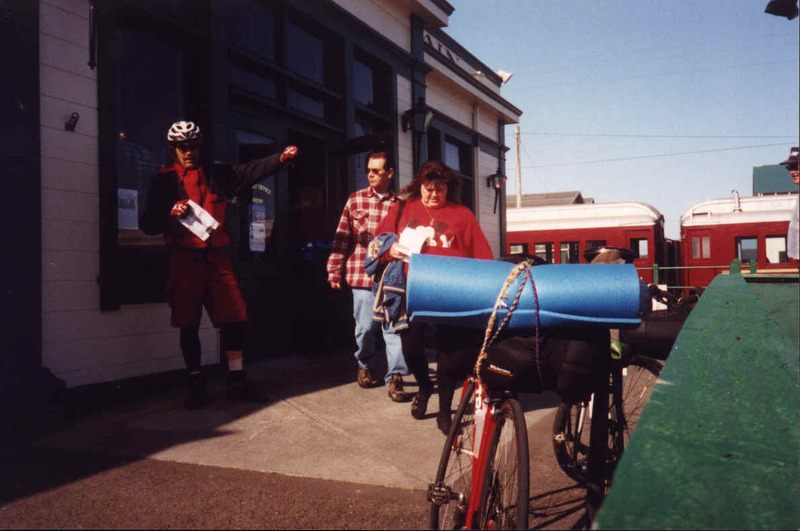 The original plan for this ride had its roots in the "Take the Train" ride that Jim and I had done in January. That ride consisted of bumping and plowing our way over forty miles of railroad ties and pea gravel. Bad idea. Dont try it. 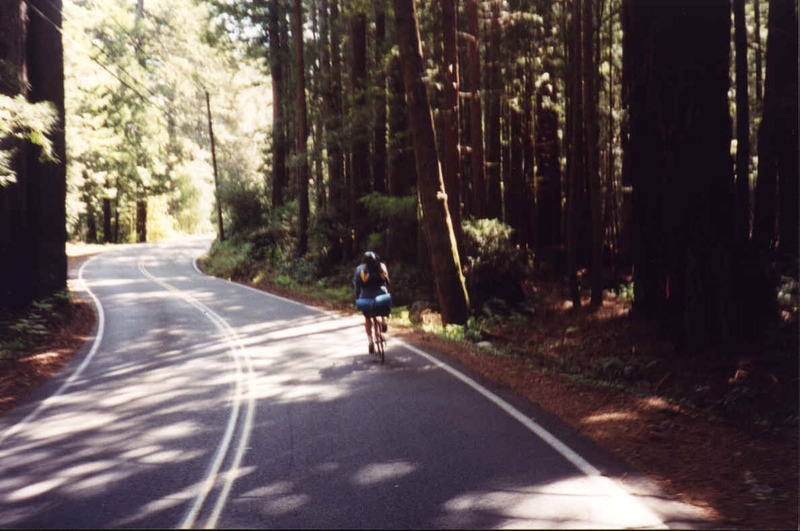 It was so tedious and slow that it cost us an extra day in the hinterlands of Mendocino County, wondering if wed ever be done with the torturous riding. Eventually we stumbled back into civilization but without enough time to take our original route, the Comptche to Ukiah road. Instead we had to settle for a direct commute back to Willits. 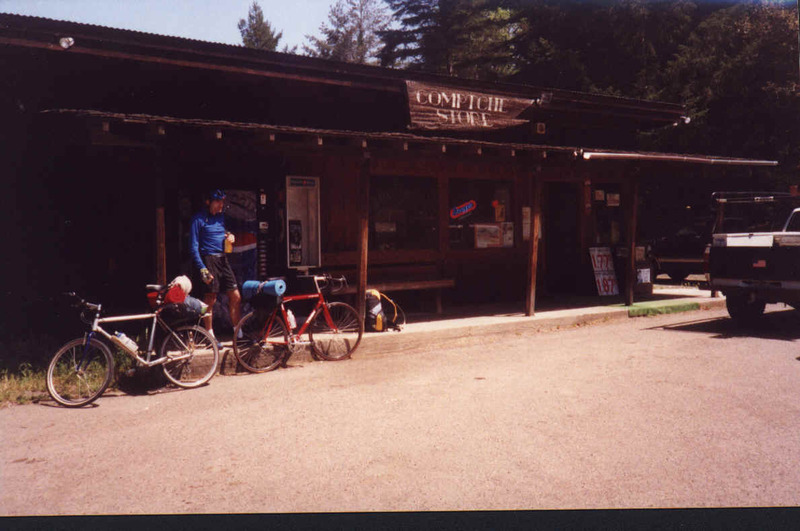 Since that ride we developed the notion of riding the Comptche road from Ukiah to Ft. Bragg, taking the train to North Spur and riding Irmulco road to Willits then riding 101 back to Ukiah. This would allow us to check out the groovy scene in the Noyo River valley from the ease and comfort of the train. The ride on Irmulco road from North Spur is about fifteen miles of dirt road that climbs nearly two thousand feet. At the eleventh hour Jim had to bail due to a pressing family matter. That left Michel and me. Saturday morning early, we motored to Ukiah. We arrived at the starting point just before 10:00. It was a beautiful, sunny spring day ideal for cycling. We assembled our gear and headed out. This tour was an experiment of sorts. The effort was made to travel as light as possible. Michel was riding his ultra light Cannondale road bike. It had not lugs for racks and consequently it took some creativity to fasten his sleeping bag and ground pad to the seat post. The rest of his gear was packed on his back. I had the Gray Ghost pressed into service this time without the Bob (Beast of Burden). 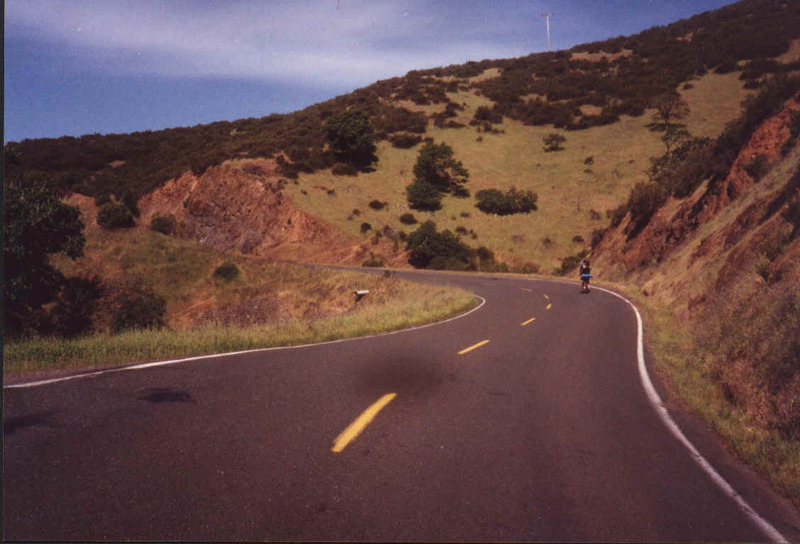 We headed out of Ukiah and immediately began a long, six-mile climb. This would be the biggest climb of the day. There would be another significant climb towards the end of the day, but not nearly as grueling. Although we were fresh, the climb seemed to go on forever. Eventually the terrain began to yield views to the west. Wisps of fog were still evident towards the coast. The road leveled then began a series of dips and short climbs before it eventually began a precipitous plunge that provided a raging downhill descent for many miles. Finally Orr Springs sailed past our view. Next, Montgomery Woods flashed by as we continued to fly downhill, though not as steep. The route joins Johnson creek and provides a nearly ideal section for touring. The road descended slightly providing good speed and the scenery was remote and relaxing. Redwood forests lined the road interspersed with fields that were festooned with a variety of spring flowers. Birds sang in the woods and the air was fresh with the pleasant scents of springtime. Originally we thought the distance to Ft. Bragg to be nearly eighty miles. This would be a huge day on the bikes. We were pleased to find the distance would be only sixty miles, making the day much more reasonable. We felt that the train ride on the following day would allow a slight respite, so that we could expend a great amount of energy on this first day. Once past Montgomery woods, the next goal on the trip was the town of Comptche. We had no idea what the town would be like or if there would be a store. We didnt need one, but often on a long ride, a small country store can provide a timely treat. We pedaled for another hour over the rolling and convoluted terrain. We saw wild turkeys, several hawks and lots of ravens. The terrain remained friendly until a few miles before Comptche when we began another significant climb. This one didnt last nearly as long and yielded another high-speed descent in to the small community. We discovered a cool country store and found suitable refreshment. We paused long enough to gather our strength. At this point we had covered a significant section of the ride. We were about two-thirds of the way across the Comptche-Ukiah road. Soon after Comptche, we began the last major climb of the day. It would last about four miles but was mild compared to the initial climb of the day. Eventually we grunted uphill until we began to see views to the Pacific. The road surface improved significantly. There were more homes present along this part of the ride. The last five miles to Mendocino were quick. The smooth pavement allowed warp speed as we descended to the coast. Finally we came to highway 101. Although 101 is relatively flat along this part of the coast, the wind was a direct headwind and resisted our effort. What should have been a quick dash for the last ten miles, turned into a struggle. The wind was stiff and very resistant. We had ridden nearly fifty miles of challenging terrain and were tired, making the winds much less welcome. For the next forty-five minutes we worked out way towards Ft. Bragg. Now the incentive became the local brewpub. Thoughts of beer flooded the mind. The concept of sitting on a comfortable seat, relaxing and catching a beer buzz held great appeal. We almost made it, but just as we entered Ft. Bragg Michel tagged a hazardous water grate and flatted. We ended up in the middle of a traffic island for several minutes while we repaired the 25-mm tire. With no spare tube for the 700 X 25 tires, we decided to try to find a bike shop. We succeeded and obtained spares. Now there was nothing else to do but cruise to the beer pub. After six hours in the saddle, the simple action of sitting down at a table and having beer served turned into an extraordinary event. The beer tasted heavenly. The flagging bodies welcomed the electrolytes. The alcohol provided the needed analgesic effect to put the whole package into cosmic overdrive. We had earned the elevated feeling. We had just accomplished a significant feat. It was no easy task to ride this route. We finished the beer event with a glass of Rasputin Stout. This gnarly, powerful beer assisted in helping us bask in the glory that we had created. MacKerricher State Park is just a few miles north of town. These miles seemed easy and swift. We checked into the hiker/biker camp to find two significant things. First the entire loop of camps was empty leaving us with our own huge, private facility. Second, there was a vast amount of fallen dead branches for firewood. Since we had minimum camping gear, there was little set up required. We gathered a huge pile of wood in preparation for the evening fire. I was a little concerned since gathering wood is not permitted in the state parks. This rule prevents the camps from being decimated later in the year when wood is at a premium. For now, we were doing the park service a favor by cleaning up the campsite. 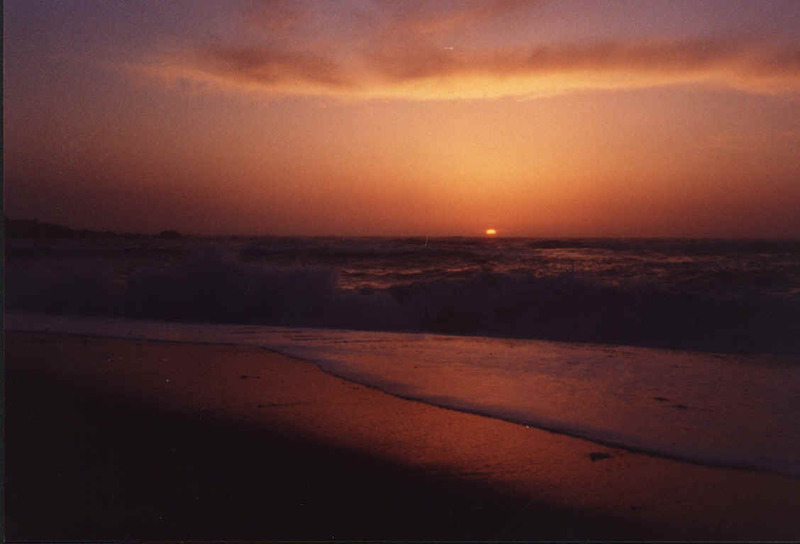 We headed towards the beach as the sun neared the horizon. There was no fog and the wind was very light. It was another touch of serendipity to have an ideal setting for the sun. The waves crashed and foamed in front of us as we communed with the end of the day. So far it had been a beauty. It was a day that was very unique. It was vastly different from the normality that governs most of our lives. The Purple Rose restaurant is only a few hundred yards from the campground. 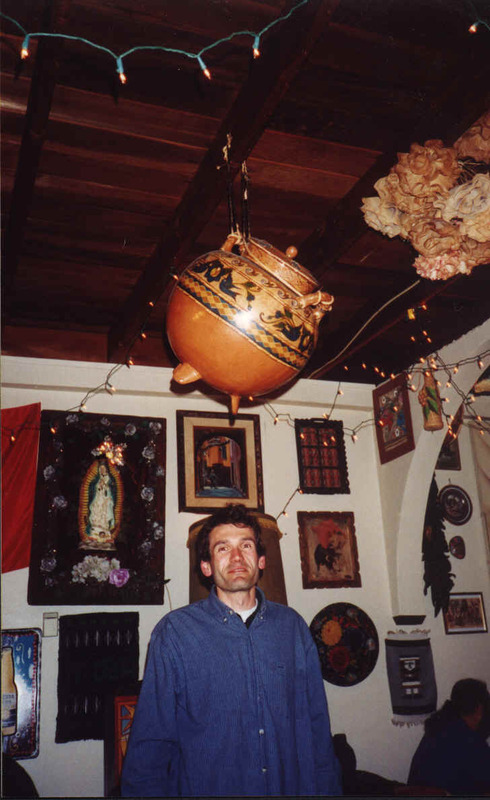 This quasi-Mexican facility provided a nourishing, reasonably tasty meal. It wasnt bad considering that we didnt see any Hispanics working there. However, after a long day of extreme calorie burning, we appreciated all of the fat and carbos that were represented in the green chilies and chili rellenos. One of the big advantages of endurance cycling is that one can eat without regard to weight issues. We topped the meal with a serving of flan, adding more tasty calories to the cycling engines. We pedaled back to the camp completely satisfied and feeling great from our successful day. Everything had worked out well. We were on a roll. So when Michel went to call about their application for a new apartment, I was confident that it would happen. It seemed that the universe was going in our direction. However, Michel was unable to connect with his wife and would have to spend the next twelve hours wondering about this important situation in his life. Meanwhile we lit the fire. It started easily and accelerated into a major conflagration. This blaze was worthy of a Dave Award. (Dave B. = master fire builder, uninhibited stoker, known to homeless worldwide as the King of the Coals). 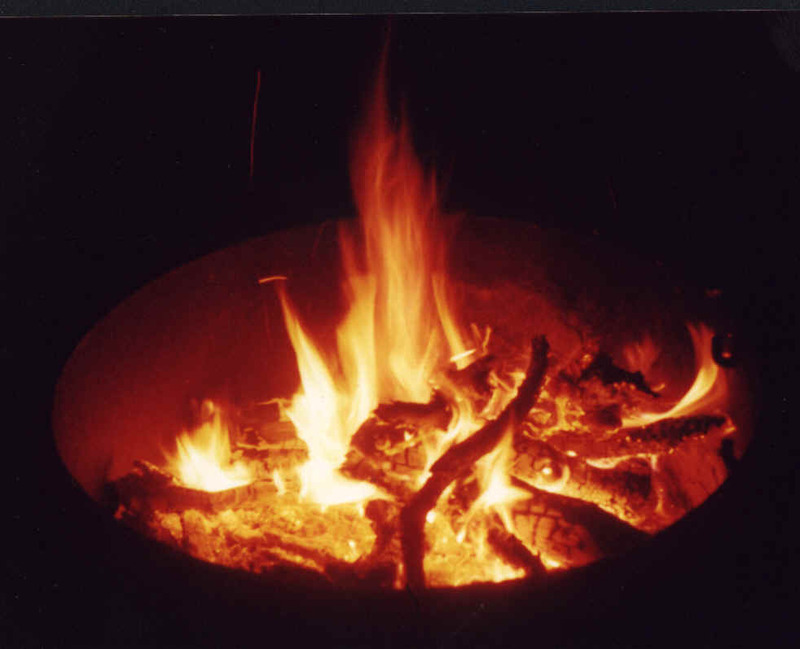 The flames danced and flickered before our eyes as we sat mesmerized by the display. Soon, the melatonin in our brains called for sleep. Our bedroom was a delightful area under a large pine tree that would prevent dew and provide a comfortable bed of pine needles. Sleep was swift and sound. The morning broke clear and mild. There was no fog or even any clouds. We leisurely broke camp and proceeded back into Fr. Bragg to Eggheads restaurant for an outstanding breakfast. The facility is adorned with a Wizard of Oz motif. Pictures and paintings adorn the walls leaving one with the notion of having one foot in that mystical place. It was a perfect breakfast. It contained a major amount of protein and carbos that we would need for the rest of the days riding. We were still feeling that the universe was smiling upon us as we headed off to the train station. I went into the office and purchased the tickets. I mentioned that we had bikes and apparently made note that we planned to get off at North Spur. We lounged in the boarding area for several minutes before a harried, prematurely balding man with an intense look on his face approached me. "I understand you are planning to get off at North Spur." He stated emphatically. "Ah, yes." I replied, "Were going to ride out Irmulco road. "No youre not." He said with all the authority he could muster from his flustered brain. "Uh oh." I thought. "This could be a problem." He continued; "Its private property out there and I cannot be responsible for you." He continued with a line of logic that would make a greedy lawyer smile. He never did touch on any reason that resonated with logic or any reality that exists other than in a bureaucrats mind. I wanted to respond that he had no responsibility in my life whatsoever, but I tried to avoid a confrontation. "We know some people out there." I tried. "Who?" He boomed with suspicion. "Dave Jones." I said, completely lying. "He works with the concession there." "No, no," He said with certainty, "I know everyone out there." Within moments I was again at the ticket office getting our money back. The sudden shift in our itinerary left us momentarily dazed and confused. However it didnt feel all that bad. I didnt think Michel would be up for a Butch Cassidy and the Sundance Kid type of leap off the train. In addition his bike was not a great candidate for the fifteen miles of dirt road leading up and out of North Spur. We accepted our fate and made the decision to simply return on Comptche road. It was a beautiful day. The air was cool and the sun was bright. April is one of the most gracious months of the year. The wild flowers delight in the brilliant days, the birds are full tilt into their most noisy and busy time of the year. Nature offers a whole new rebirth of beauty in this spring month. To be on a bike in the midst of it all is a rare treat. Further expanding the experience was the remoteness of the area. Very few cars passed us even though it was a beautiful weekend. With renewed vigor and a clear course charted, we began to mash the pedals for the next fifty miles. Although we can shred at speeds near twenty on the flats, faster downhill, we still only managed to average a little over nine miles per hour. Included were all the stops that come with touring. In century mode, one may ride for hours without touching the ground. Touring allows a certain relaxed attitude, even though we pressed pretty hard when we were riding. In the beginning I was somewhat uncertain of Michels abilities on the road since I had only ridden with him on mountain bike moonrides. He is usually struggling at the end of the pack at night. By day however, the demur Frenchman became a cycling machine. He set a blistering pace on the first climb of the first day and never let up. The wind threatened to be a headwind at first then relented to a neutral wind then became a nice tailwind when we turned eastward on the Comptche/Ukiah highway. There is an initial climb into the foothills, then the road levels for several miles. During this stretch we were able to click off many miles in good time on very smooth pavement. It seemed that we could raise our average speed significantly. The road surface eventually deteriorated. The poor quality of the road required much attention. More so for Michel with the skinny racing tires. My fatty 26 inch cross tires fared better in the bad conditions while Michel was able to shred on the smooth pavement. After another mild climb we began the four mile descent back into the little town of Comptche. Again we stopped at the store and drank refreshing beverages. We relaxed and watched for a small slice of time, the life of a very small town. The pace of life was clearly moderate compared to the urban brethren who find life to be a mad, constant dash. Here life seemed more clearly defined in the natural order, not the corporate. Whether it was the dirt-bikin four-wheelin ranch types or the back to the earth, organic types, clearly life seemed much less rushed. There was a significant climb out of Comptche. The road twisted and turned for several miles before we got to spin the wheels at speed once more. Now the terrain rolled and gently climbed towards the mountains that protect Ukiah. This was the most remote part of the ride. The natural setting combined with the near perfect weather to make this a memorable section of the outing. We had roared past Montgomery Woods on the first pass. 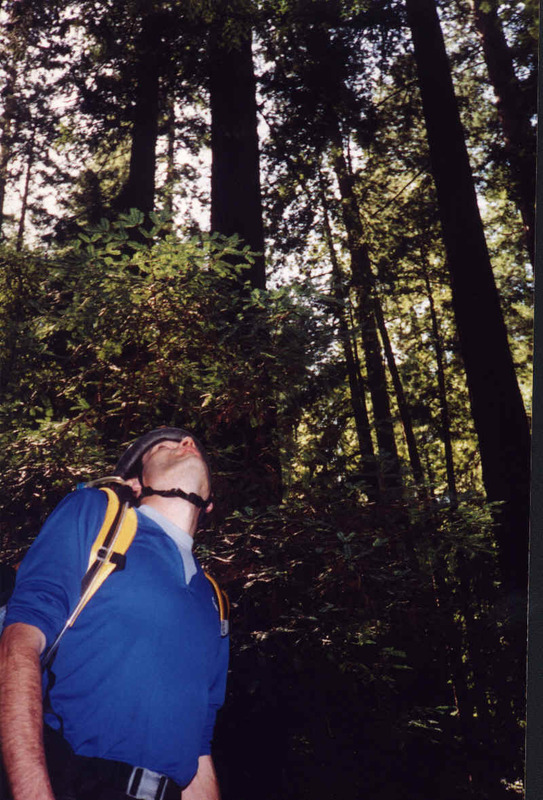 This time we vowed to stop and check out the redwoods. Someone had mentioned that the tallest tree in the world was located in this grove. Because of souvenir hunters no one would say which tree was the one. It didnt really matter. There were many, many giant trees in the grove. It provided a sense of very special beauty. To consider that many of these giants were over 2000 years old was awe inspiring. They had seen a huge amount of history. They had seen the coming of the white man to the continent and the associated destruction of nearly the entire country. They must wonder what is in the mind of these marauding men who would destroy such beauty for very short term use. Within less than a century those fallen giants have ended up in the dump. It seems a crime when one stands in the presence of these magnificent creatures. The stop at the redwoods provided a much needed lunch break. We had pedaled over 40 miles and were in need of food. 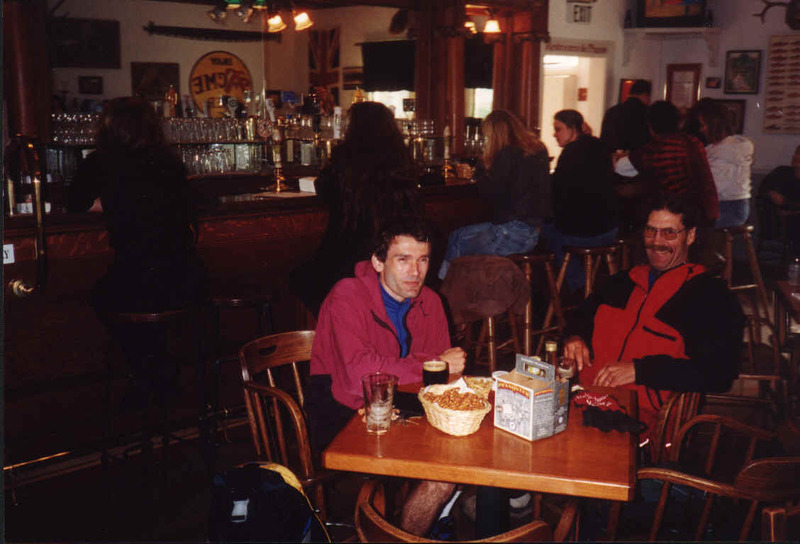 We grazed on a variety of candy bars that provided the needed energy to begin the long, tedious ascent over the high terrain that separates Ukiah from the coastal valleys. At Orr Springs I stopped to check out the facility. It is a lovely resort, very small and intimate. It seems an ideal spot to escape for a weekend and lounge in the mineral pools and enjoy the natural setting. From Orr Springs the road begins to climb steeply. It climbs for nearly five miles before finally topping out on a high ridge. Just when one thinks the climbing is over, a series of short climbs keep the biker working and wondering when the last climb will finally yield to the screaming downhill. The downhill was fast enough to be frightening. The same hill that took us nearly an hour to climb on the day before passed in a matter of a few minutes. Finally we rolled back to the car. Although it was rewarding to reach the end, there was a slight sense of sadness that this adventure was over. We stopped at the Hopland Brewery for badly needed electrolyte therapy. In our tired state, the beer tasted heavenly. Finally we climbed back into the car and rolled back to Calistoga and the end of a great weekend of cycling. Our original plan was foiled by a humorless bureaucrat whose warped agenda does not contain much sense of adventure. Yet, it seemed OK. We left the adventure feeling pleasantly tired. It was a weekend full of great bikin fun and it left the door open for another attempt at the train ride.